This impressive 650 sq. m / 7,000 sq. 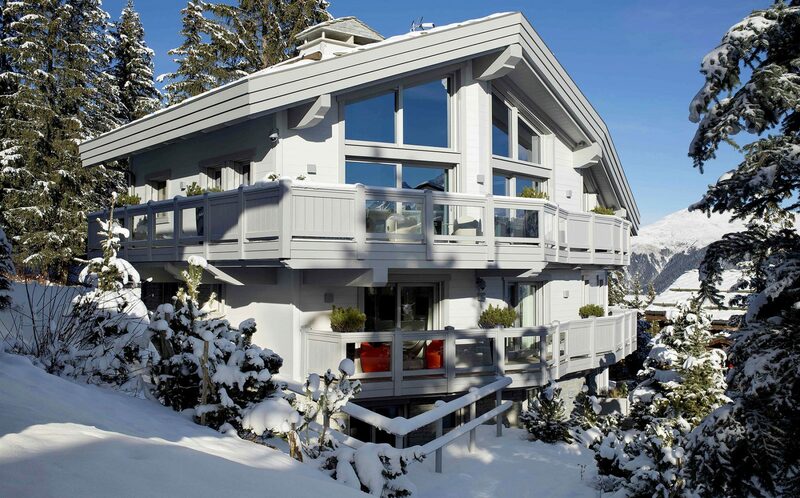 ft luxury ski chalet in the prestigious Alpine resort of Courchevel 1850 required a modern interior design with a relaxed family feel. 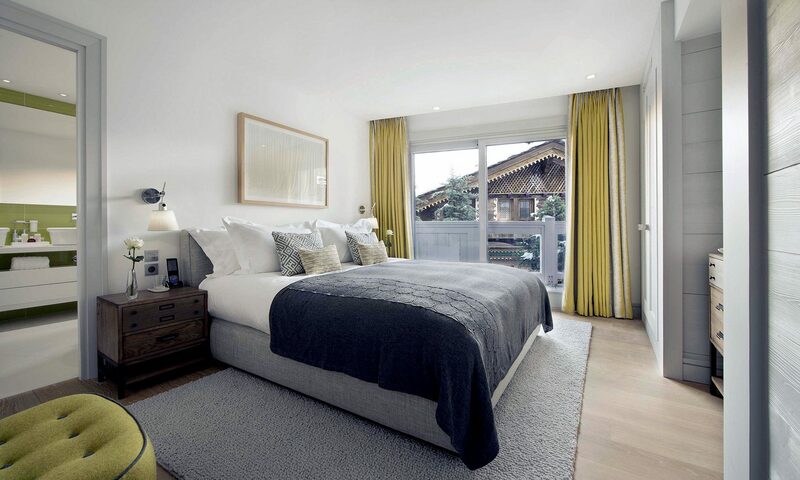 Accommodating up to 16 people, with luxury basement pool & spa, games room, gym and cinema space, we used fabrics to inject colour into a cool, contemporary palette that still references a chalet feel with textured internal timber work. 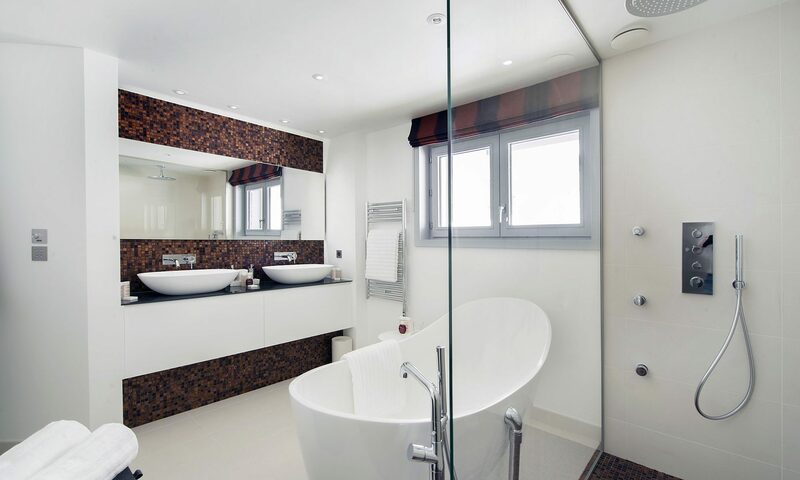 A take on certain aspects of traditional chalet design gives this room a contemporary freshness that reflects the client’s taste. The central core is clad in an evenly cut stone that shifts the ‘rustic’ notion of mountain ‘man-made’ towards a mood of cleaner line-modernity. 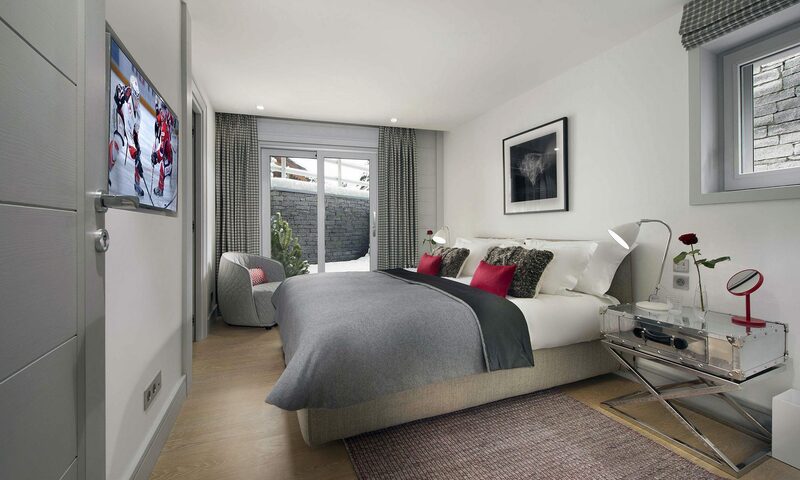 Plainer walls and painted structural features emphasise this feel. The sliced timber slats of a specialist wallcovering are reminiscent of wooden chalet cladding – but here take on a very different appearance. Colour and texture are natural and subtle, patterns feature contemporary geometrics. Scaled up sofas create an especially cosy family or social space and woollen cushions appear to have been knitted on giant needles. 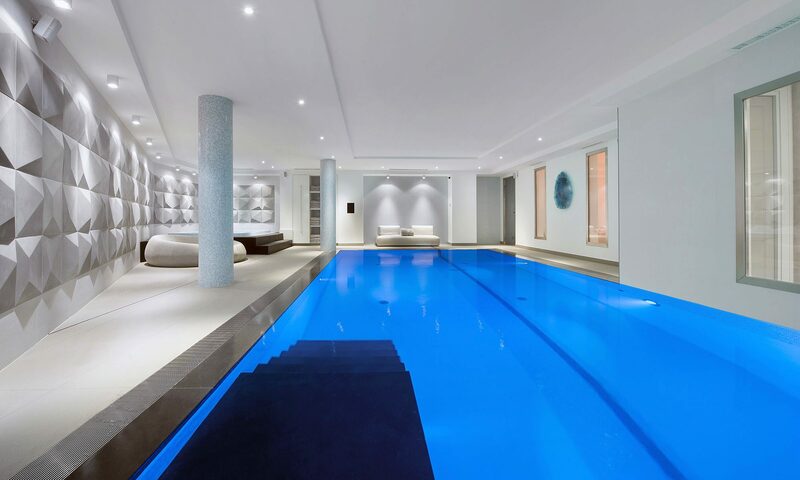 The basement games room forms part of the chalet’s entertainment facility, where glimpses of the adjacent swimming pool may be seen through glazed panels. Despite the fact that there is no natural daylight on this floor, punchy colours and carefully considered lighting create a fun and vibrant environment. Up on the entrance level, although the ski lift chair really isn’t going anywhere! – it sets the rather playful tone for the entire residence, along with the white neon sign, ‘Pow Pow’, the name of the chalet, christened by one of our client’s children! Linking each floor of the chalet, we designed a unique laser-cut steel staircase, which snakes and dances it’s way through the building core. 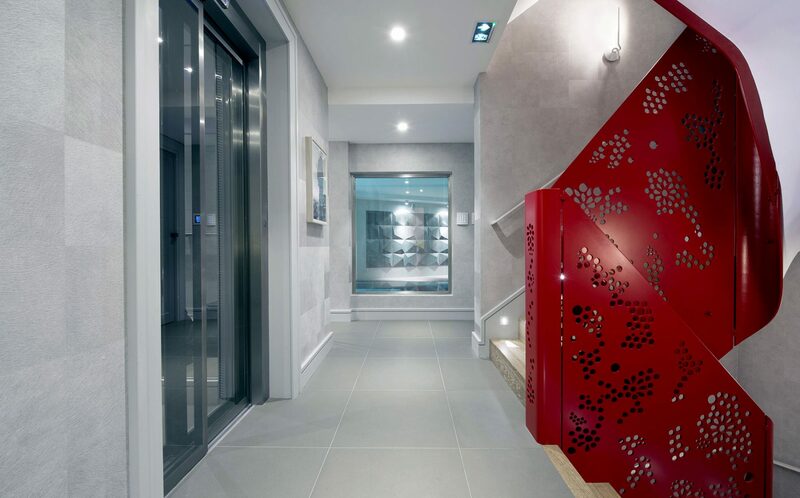 The startling red finish and almost ‘kinetic’ cut-away pattern create a sense of dynamic movement in the stairwell space. The sense of playfulness continues in the children’s crash den, where bespoke bunk beds, formed in accent-colour Corian, create a hard-wearing rest and play environment. 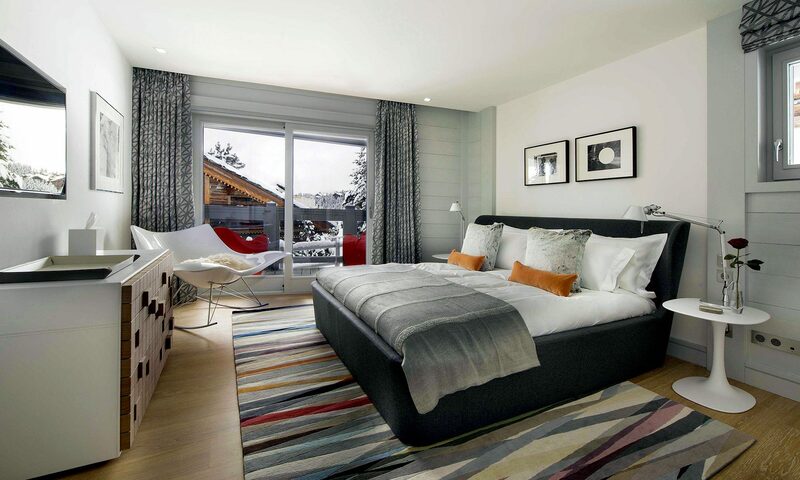 Bedroom designs throughout reflect the fresh vitality of the chalet and comfortable, tactile furnishing elements grace each individually designed room, with en-suite bathrooms tailored with materials and colours to complement each palette and style. 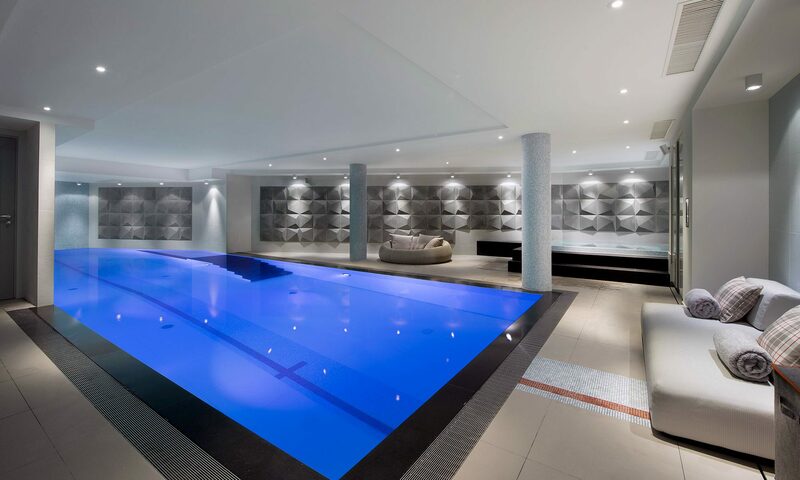 Serious swimming was an important concern for our client, so meticulous attention to detail was applied to our design for this space, in terms of both usability, practicality and selection of materials and finishes. The same injections of colour, brightness and crisp surface textures imbue the spa and pool with a fresh, contemporary feel, providing a facility for exercise or poolside relaxation. A striking wall of three-dimensional concrete tiles forms a dynamic, flowing wall pattern, evoking both the surface movement of the pool and the visual impact of the mountainous crags of this Alpine setting. 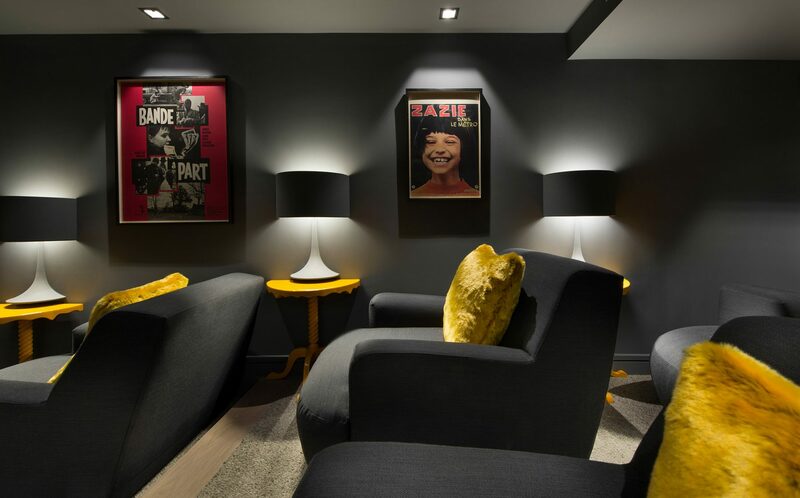 The exuberant spirit of, ‘La Nouvelle Vague’, permeates this compact and colourful home cinema setting. 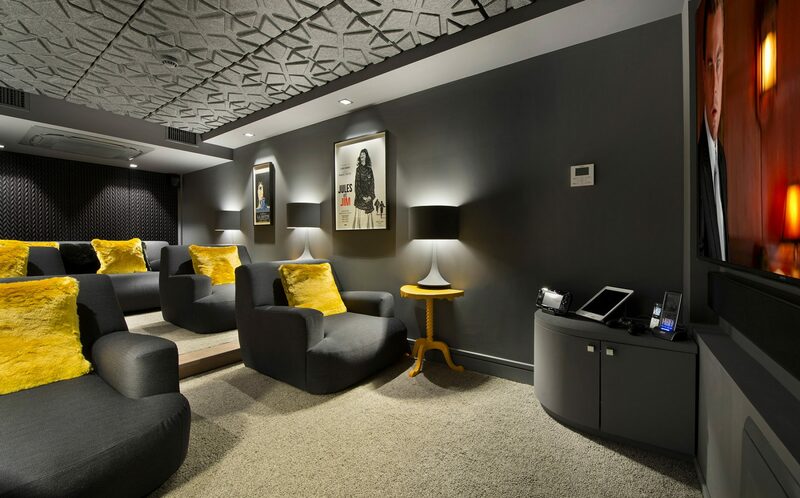 Comfortable, rounded seating in restful charcoal grey tones, stands off a deep, ‘sink into’, woollen carpet; this natural palette allows sharp accent colours to catch the eye. 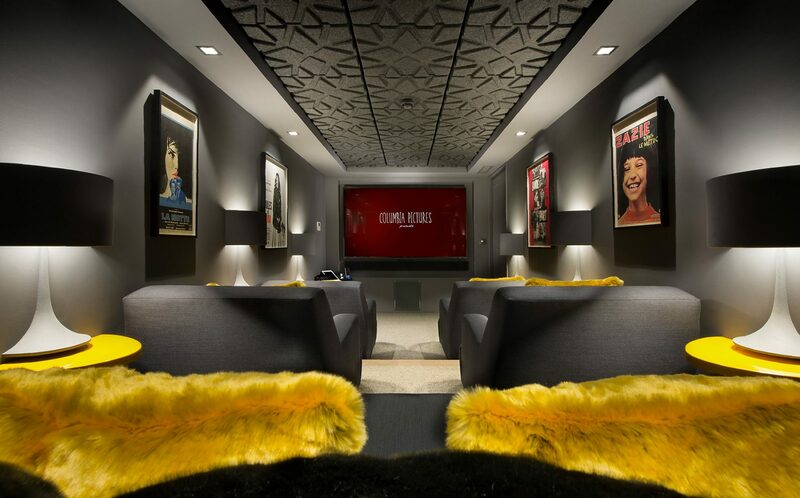 Padded and patterned acoustic wall panels add texture and movement, whilst plastered-in table lamps seem to emerge from the cinema walls, floating above the dazzling yellow demilune side tables!